Please see details and registration information below for an on-farm food safety mock audit at Todosciuk Farms in Howell. Learn about on-farm food safety while growing produce in fields and in hoophouses year-round to become food safety certified to market, as a group, to hospital and university customers. 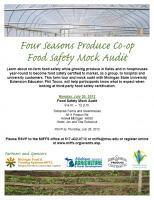 This farm tour and mock audit with Michigan State University Extension Educator, Phil Tocco, will help participants know what to expect when looking at third-party food safety certification. See the attached flyer or visit www.miffs.org/events.asp. Register online now or contact the MIFFS office at 517-432-0712 by Sunday, July 29 if you’d like to attend. This workshop is hosted by Michigan Food & Farming Systems (MIFFS) and is funded by a grant through the Michigan Department of Agriculture and Rural Development (MDARD). Partners include the Food Systems Economic Partnership (FSEP) and Four Seasons Produce Cooperative.